goodness gracious: coming up for air & flying alarm clocks? coming up for air & flying alarm clocks? Okay, still don't have my head quite above water... the husband just returned a couple days ago after three solid weeks away on business... oi... need I say more? I can kind of see the light... I'm almost there! 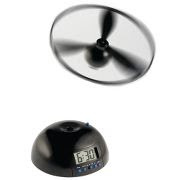 Came across this nifty thing today when I ran through four, or more, days worth of email... A "Flying Alarm Clock." I think I could use this. Sometimes I plug my alarm clock in across the room or in random places, just to make myself actually get out of bed to hit the snooze button! This might do the trick... chasing something around every time the alarm goes off just might nip my hour long snooze-button-hitting-extravaganza. Seriously, I set the alarm for 6:30am and hit snooze repeatedly until 7:30am, when I actually drag myself out of bed. Pathetic, I know... so, so, so not a morning person. Not an aesthetically beautiful alarm clock, but it could be a beautiful thing for starting the day on time? love it!! so is this thing suppose to actually hit you to wake you up? i do the same thing with the snooze button and could use a push to get up. glad you were able to come up for a little air. husband gone for 3 weeks - no you definitely needn't say more.